Vegans don’t have to miss out on Easter fun, thanks to more and more companies introducing vegan Easter eggs! A lot of chocolate eggs and bunnies are milk chocolate…but more and more vegan Easter candy hits the shelves every year, including dairy free Easter eggs. Whether you’re buying dairy free Easter eggs for kids, or for yourself (I always buy myself an Easter egg too! ), here’s your guide to vegan Easter chocolate and Easter eggs. 1. What are vegan Easter eggs? 2. Where can I buy vegan Easter eggs? 4. What supermarkets sell vegan Easter eggs? What are vegan Easter eggs? 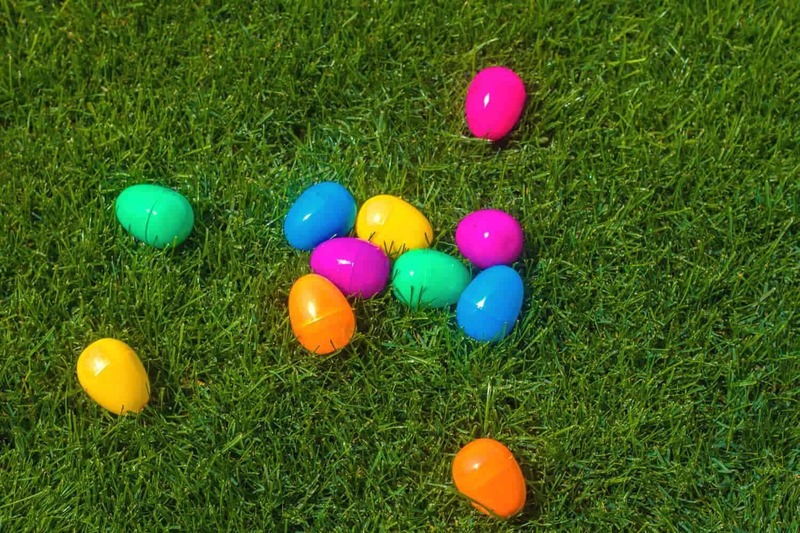 Vegan Easter eggs are simply chocolate eggs that are free from dairy or any other animal products (such as dairy-derived ingredients like cream, milk fats or whey). Because lactose comes from dairy, they’re also lactose free Easter eggs, making them suitable for anyone with a lactose intolerance. Many of these allergen free Easter candy eggs are also gluten free, nut free and free of other allergens but always check. The eggs might be dark chocolate or they might be made with rice milk, soya or other ingredients instead of milk. Just like non-vegan eggs, they come in milk chocolate or white chocolate forms (made with non-dairy milk). One thing to note is that due to changes in allergen labelling laws a lot of chocolate manufacturers in the UK now note underneath the ingredients that their chocolates ‘may contain traces of milk’ — this does not mean the chocolate contains milk (consult the ingredients list for that information), just that the chocolate was manufactured in the same facilities as products containing milk. This labelling is to protect those with a very severe milk/lactose allergy. Most (though not all) vegans consider these products still vegan, so check with the vegan in question. If you’re buying for someone with an allergy, you’ll need to find out about the severity of their allergy and what labels they look for when making purchases. Where can I buy vegan Easter eggs? These days, you can find vegan Easter eggs in pretty much any supermarket in the UK (see below for a vegan Easter candy list in supermarkets). 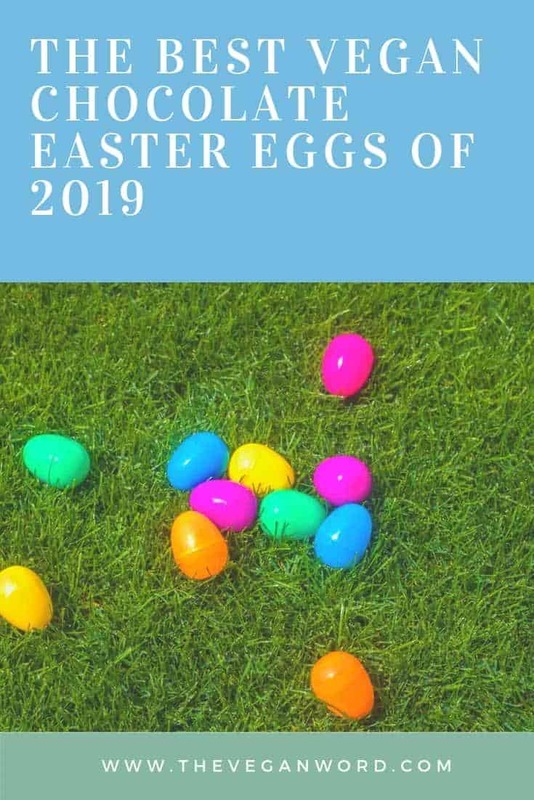 If you’re wondering where to buy vegan Easter eggs most easily and with the widest selection, you can buy them online, and for your convenience I’ve linked to some of the very best vegan Easter eggs (UK wide availability) on Amazon below! Here are the very best vegan Easter eggs 2019 has to offer! Whether you’re looking for dairy free milk chocolate, dark chocolate, white chocolate, creme eggs or mini eggs, you’ll find all of the above in a vegan form. 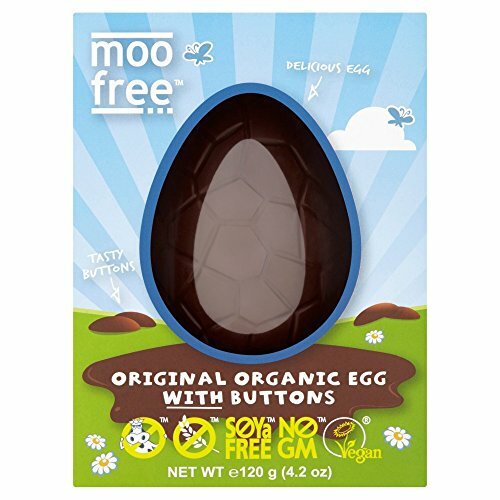 If you’re looking for a classic Easter egg, I find vegan Moo free chocolates very reminiscent of milk chocolate (but they’re milk free Easter eggs, of course!). These chocolate eggs are BIG, come with chocolate buttons and come in three different flavours — the classic (which is the one that reminds me of milk chocolate), chocolate orange and honeycomb. All three are vegan, and the classic is also gluten free and soya free. Click here for the latest prices and availability. 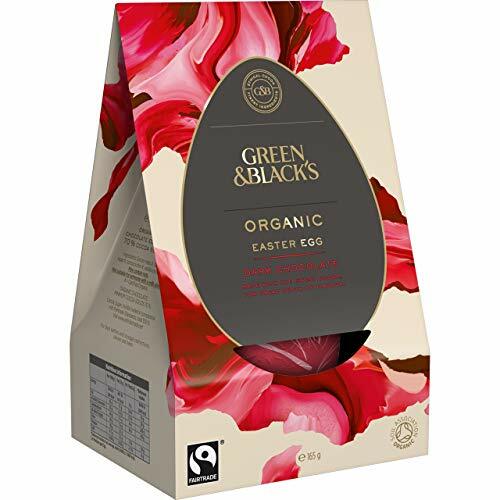 The ultimate dark chocolate vegan Easter eggs, the Green and Blacks Easter egg is a classic choice. Their non dairy Easter eggs are both organic and fair trade. Note that although the Amazon page lists milk as an ingredient, the product in shops (and on the Green and Blacks website) does not so this is likely down to misinformation in Amazon. Vegan mini Easter eggs filled with peanut butter from Montezumas? YES PLEASE! Vegan Cadbury mini eggs might not exist (yet) but these peanut-butter filled dairy free mini eggs look way better anyway. These dairy free Easter eggs for children are perfect for adults, too. Get them on The Vegan Kind, an online vegan supermarket. Think vegan creme eggs sound like the stuff of fairytales? They're real! And they're AMAZING. These dairy free chocolate Easter eggs are filled with creme, just like a Cadbury creme egg, but completely lactose and dairy free. As far as free from chocolate Easter eggs go, it doesn't get much better than this. Get them on The Vegan Kind, the vegan online supermarket. 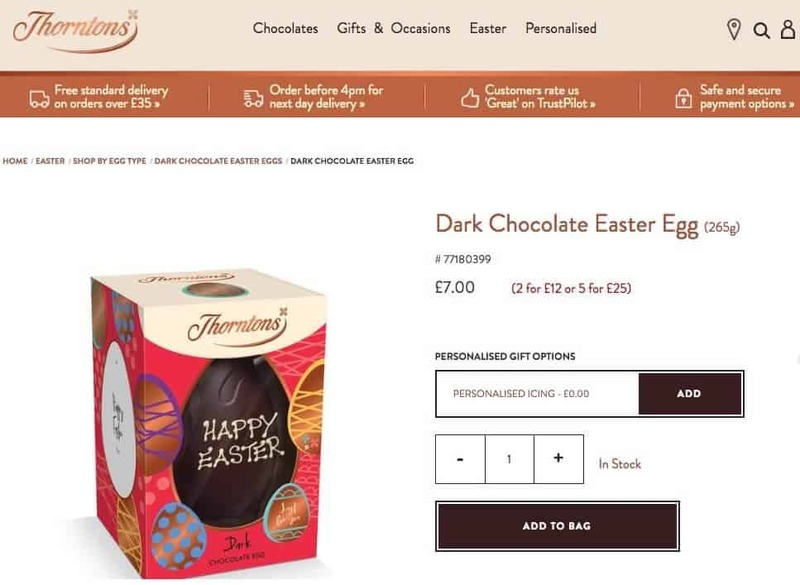 The only vegan vegan Easter egg offering from Thorntons is their dark chocolate egg, with no personalisation/no icing. These dairy free Easter chocolate eggs are vegan, but the icing isn't (they offer to write personalised messages in icing on the front of the egg), so be sure to order yours without any icing! Vegan chocolate Easter eggs in white chocolate are no longer hard to come by, thanks to Choices and Tesco. You can find the Choices free from white chocolate eggs in branches of Holland & Barrett and some supermarkets. And in 2018, Tesco released an own brand vegan white chocolate egg with white chocolate buttons, and presumably they'll follow suit again in 2019. Thankfully, you'll find dairy free chocolate eggs UK wide these days. This non-traditional egg (most likely appealing to adults only!) is a wooden, handpainted egg filled with the best chocolate truffles ever. This vegan chocolate hazelnut truffle-filled egg won the annual Easter Egg taste test. It's not technically a chocolate egg, because it actually consists of hazelnut truffles in a handpainted, wooden egg-shaped box. Still, it impressed judges at Good Housekeeping so much it not only won the category it was entered in (free from) but also overall. At just a shade under £25, it's not a budget option, but if you love truffles, I highly recommend it. These vegan chocolate hazelnut truffles were also my Valentine's chocolate recommendation. You can get it on Ocado or from Planet Organic. Another non-traditional egg (again, probably just for adults). Last year, I bought this egg since it's the prettiest Easter egg I've ever seen. It's a handcrafted vegan milk chocolate half eggshell, stuffed with speculoos (Lotus bisoff spread) made by The Den Newport Shropshire, and filled with 10 hollow mini eggs. Luckily, before I bought it I was warned that it was only half an eggshell (not a traditional 'full' chocolate egg) and that the eggs inside were hollow. Frankly, while I love chocolate, a full chocolate egg is often a lot for me to eat, so I didn't mean. However, this is a fairly small egg and, at least last year, cost £15, so I did question myself a lot about spending so much. Would I buy it again? I'm not sure I could justify another £15 egg, and it didn't contain quite as much speculoos paste as I'd hoped (I'd somehow imagined the interior of the egg stuffed with speculoos, when obviously it wasn't -- that much I could tell in the photos -- it had speculoos between two layers of chocolate). However, it was really delicious and I love supporting independent producers. If I had £15 spare I'd consider it again. Look how pretty it is! You can pre-order it (shipped across the UK) here for £15. What supermarkets sell vegan Easter eggs? These days, you can find lactose free Easter eggs UK wide in supermarkets. I recommend you check out independent whole foods shops near you. If you don't have one, try your local supermarket but bear in mind selection varies. Range may vary depending on the size of the supermarket and locale. 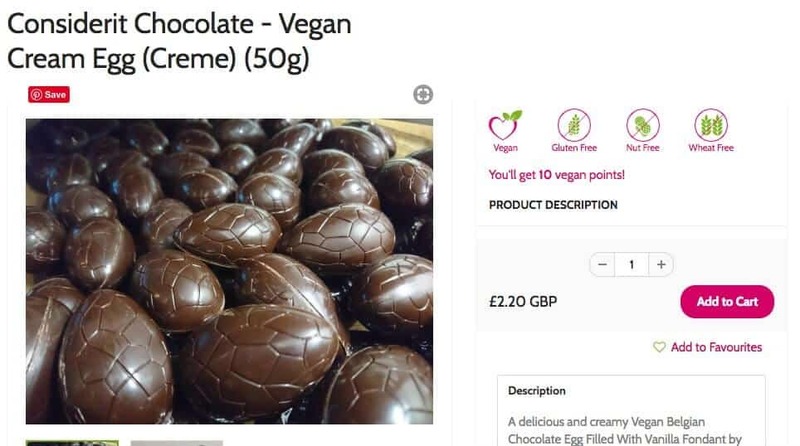 If you can't find vegan Easter eggs local to you, The Vegan Kind is an online supermarket delivering across the UK, or select from the list of products above, most of which I've linked to places to order online (Amazon or The Vegan Kind). Tesco has a whole range of own brand vegan easter eggs. Tesco vegan eggs can be found in the free from section. They come in flavours like dairy free white chocolate (with buttons or coins), milk chocolate (with coins or buttons) and caramel flavoured with truffles. Their own brands chocolates are budget-friendly and start at £2.50. They also sell Moo free vegan eggs and Choices vegan Easter eggs. Asda now have a range of own brand vegan Easter eggs. The range includes chocolate eggs with orange chocolate buttons, a dark chocolate egg with truffles and a vegan white chocolate egg. Find the vegan Easter eggs at Asda in the free from section. Waitrose stock the Moo Free range of free from Easter eggs, which come in milk chocolate, chocolate orange and honeycomb flavours. Morrisons also have the Moo Free Easter egg range. Choose from chocolate orange, milk chocolate or honeycomb. Marks and Spencer sell a dark chocolate Easter egg, the 'Made without Dairy' dark chocolate egg. Find Moo Free vegan Easter eggs at Sainsburys, along with some own brand dairy free options: their Deliciously Free From choc egg and discs and Deliciously Free From milk choc egg and discs. Coop's Easter egg range includes a vegan Easter egg, the Free From dairy-free chocolate Easter egg and coins. Looking for Easter candy UK? These vegan Easter treats will satisfy your sweet tooth, and make great vegan Easter gifts. Read on for vegan Easter basket ideas. This vegan chocolate Easter bunny from Moo Free is small (around the size of a mini choc bar) so I recommend opting for a larger package rather than a single bar. 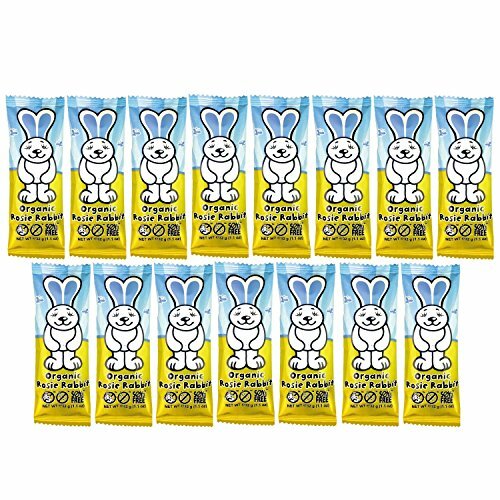 This organic Easter candy is gluten free as well as lactose free, so suitable for allergy sufferers. The Rosie Rabbit dairy free Easter bunny is a small dairy free milk chocolate. Click here for the latest prices and availability of the dairy free chocolate Easter bunny. 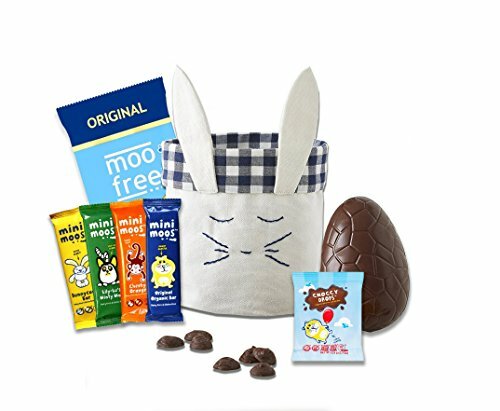 These vegan Easter gift baskets from Moo Free chocolates make the perfect dairy free Easter treats for a lactose intolerant or vegan child. This vegan Easter candy hamper looks great. Moo Free chocolates were the first chocolates I ever tried that really tasted like milk chocolate to me! The all vegan hamper comes with a vegan chocolate egg, an original vegan milk chocolate bar, different flavours of mini chocolate bars, all in a cute bunny hamper. Or, send a non-traditional Easter basket in the form a vegan subscription (here are my reviews of the best vegan boxes). Aren't jelly beans vegan? Not all of them are -- some contain gelatin or other non-vegan ingredients. 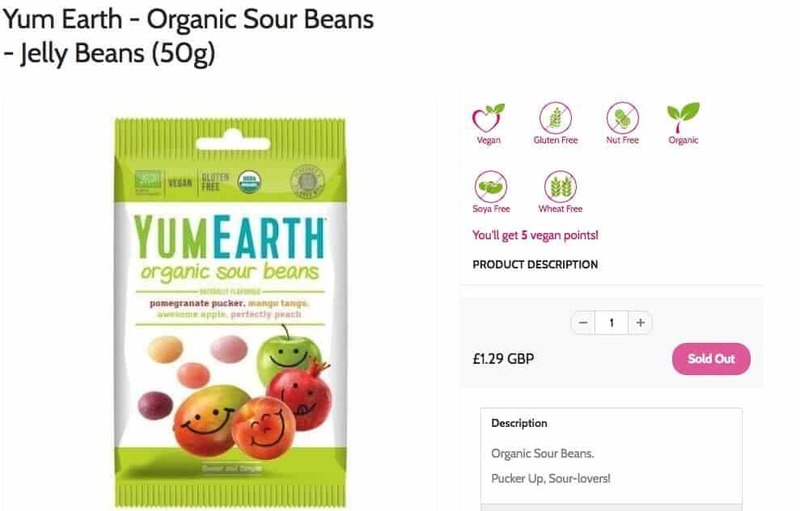 You can rest assured these jelly beans from all-vegan online supermarket The Vegan Kind are completely vegan. Plus, they deliver across the UK! Ended up with too much vegan Easter chocolate this year (how's that even possible?). Break your chocoalte up into chunks and make this amaretto, cherry and chocolate chunk ice cream (just leave out the amaretto if you're making it for children!). Please note this post contains affiliate links, meaning if you buy through them I will earn a small commission, at no cost to you. As ever, I only recommend products I either buy, or would love myself. I hope you got to taste test all the various options! I think I got one at Montezuma last year – maybe it was a plastic free one? It was decent but not sure I’d be rushing to get another. The speculoos egg looks so beautiful. I think I’ve tried the creme egg before too and they were amazing. I’ll definitely be hunting those down again this easter!